Toyota has had its flag planted firmly in the ground of the midsize sedan segment for decades now. The all-new 2018 Toyota Camry, which comes in a variety of colors, promises to reassert the manufacturer’s dominance in a competitive segment, which should make it an even more popular pick for families throughout Smyrna. In addition to new performance capabilities, you’ll also find a variety of thrilling new features across the Camry’s various trim levels. Get a first look here, and then find the perfect Camry trim for your budget and needs at Marietta Toyota! 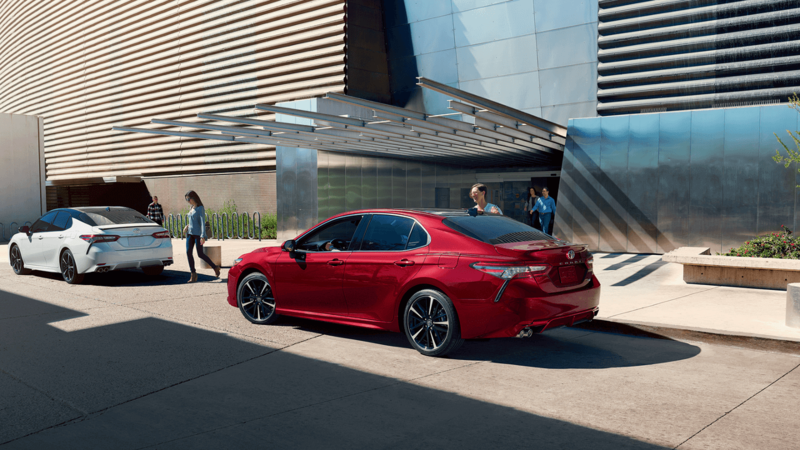 Like most Camry models, the LE comes with a capable four-cylinder engine, as well as features like a power driver’s seat, 17-inch alloy wheels, and the generous Toyota Safety Sense® P (TSS-P) driver assist package. If you’re looking for a sporty and stylish feel with your Camry, the SE delivers just that, complete with a sporty black front grille design and imposing 18-inch black machined-finish alloy wheels. The Camry XLE also gets 18-inch wheels, as well as the impressive Entune™ 3.0 infotainment system with Connected Navigation and App Suite. The XSE resembles the XLE in many ways while also equipping the Camry with sporty flourishes like 19-inch black machined-finish alloy wheels. The XLE and XSE trims are also offered with a 3.5L V6 engine, in which case you’ll get a performance bump up to 301 hp and 272 lb-ft of torque. Both of these V6 models also get you a high-end JBL® with Clari-Fi sound system, as well as a panoramic sunroof with power tilt and sliding functionality. Beginning in fall 2017, there will also be a new base L trim available from just $23,495 MSRP*, which will include standard features like TSS-P and the Entune™ 3.0 Audio and Connected Navigation and App Suite. In countless ways, the redesigned 2018 Toyota Camry has been equipped to satisfy the needs of a wide swathe of drivers, from Atlanta city commuters to family drivers all throughout Smyrna. No matter what your priorities may be, there’s likely a 2018 Camry trim that’s right for you! Visit Marietta Toyota today, located at 750 Cobb Parkway S in Marietta, GA, and browse our selection of new Camry models. You can also contact us at (470) 938-8430 for more information.